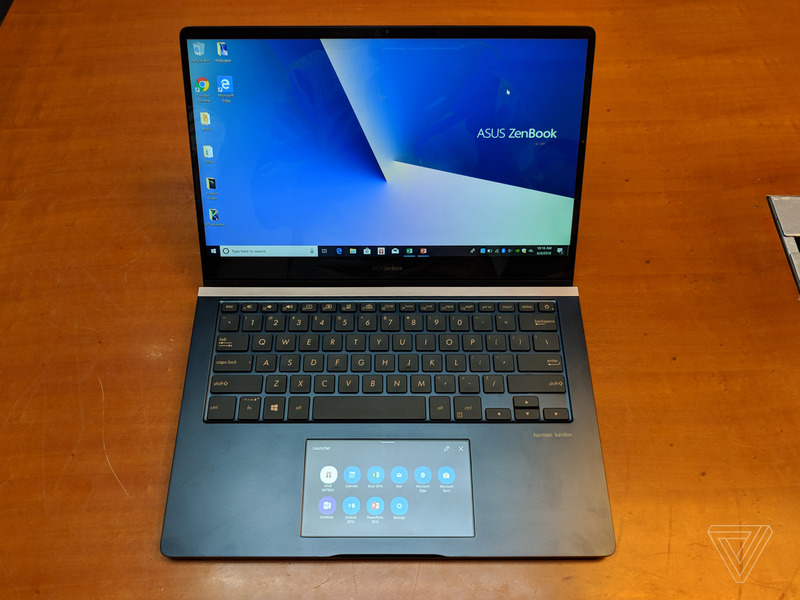 Unveiled at Computex 2018, the Asus ZenBook Pro is the new pinnacle of Asus’ premium laptop range, and it comes with an attention-grabbing new feature: a smartphone-sized touchscreen in the place of the regular touchpad. 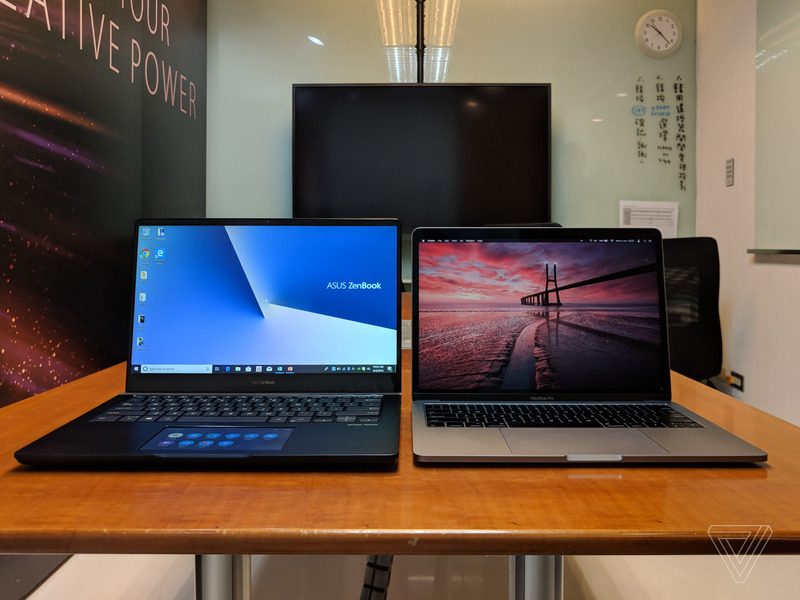 I got to grips with the two ZenBook Pro models and their so-called ScreenPads here in Taipei, and I was pleasantly surprised by how well implemented and potentially useful this apparent gimmick feature is. 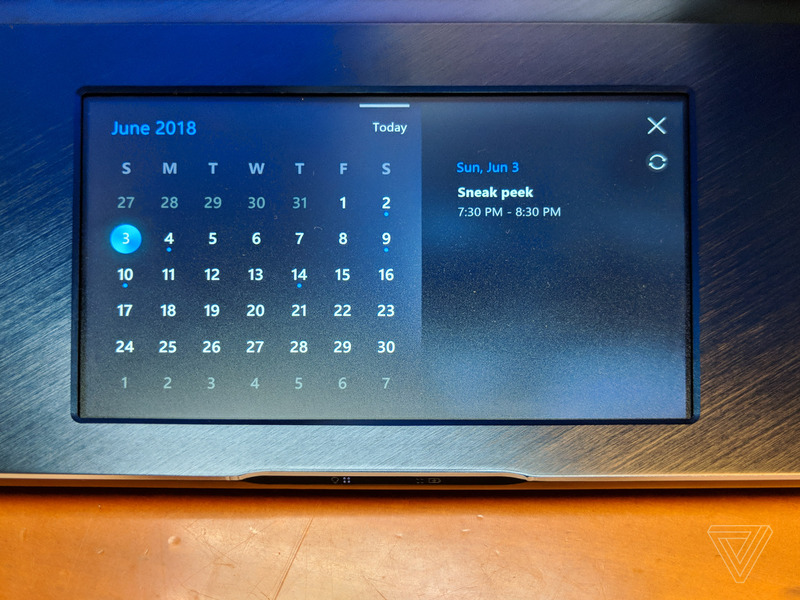 Unlike Apple’s limited and unhelpful MacBook Pro Touch Bar, the Asus ScreenPad doesn’t take anything useful away like physical keys. It resides exactly where the laptop’s touchpad usually does, and it works exactly as a regular touchpad does. 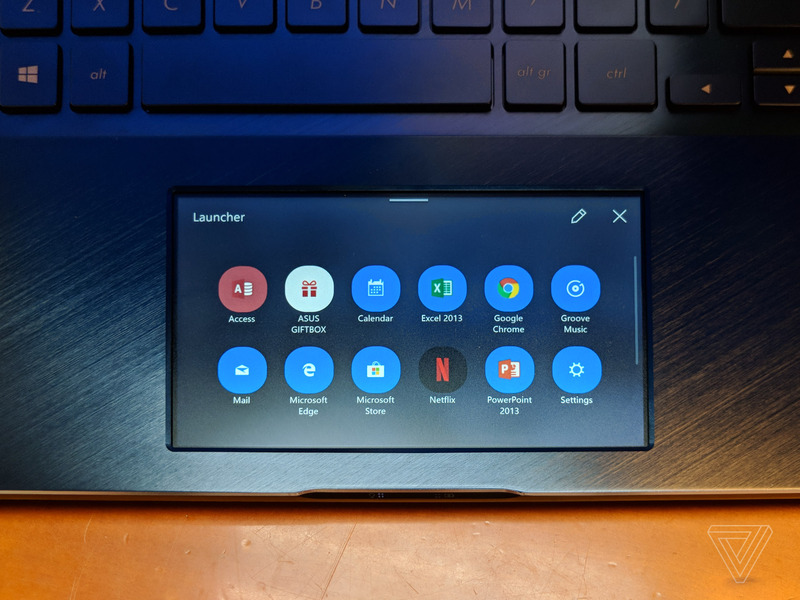 But the ScreenPad is “the world’s first smart touchpad,” in Asus’ words, because it can also serve as a multifunctional touch-enabled display, a sort of dumbed-down smartphone that’s integrated with your Windows PC. 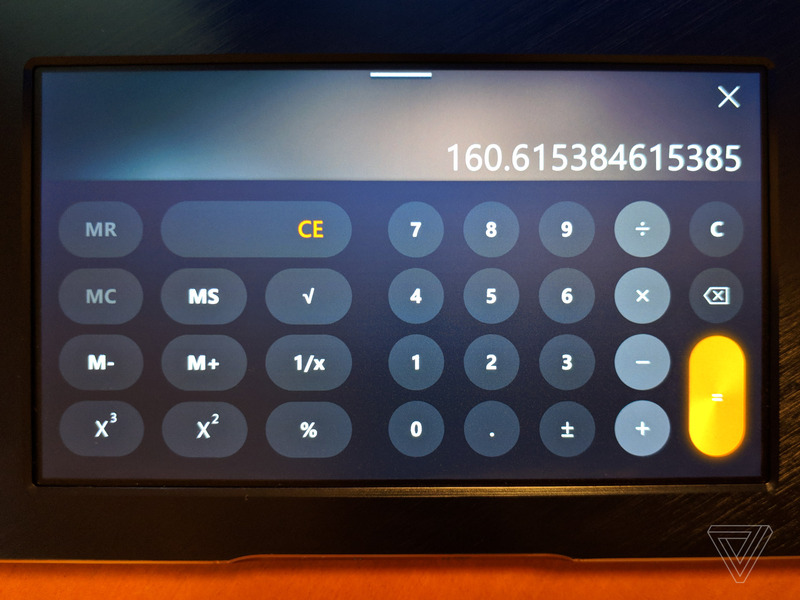 Spanning 5.5 inches with a 1920 x 1080 resolution, the ScreenPad can be turned into your app launcher, calculator, calendar, or numeric keypad. 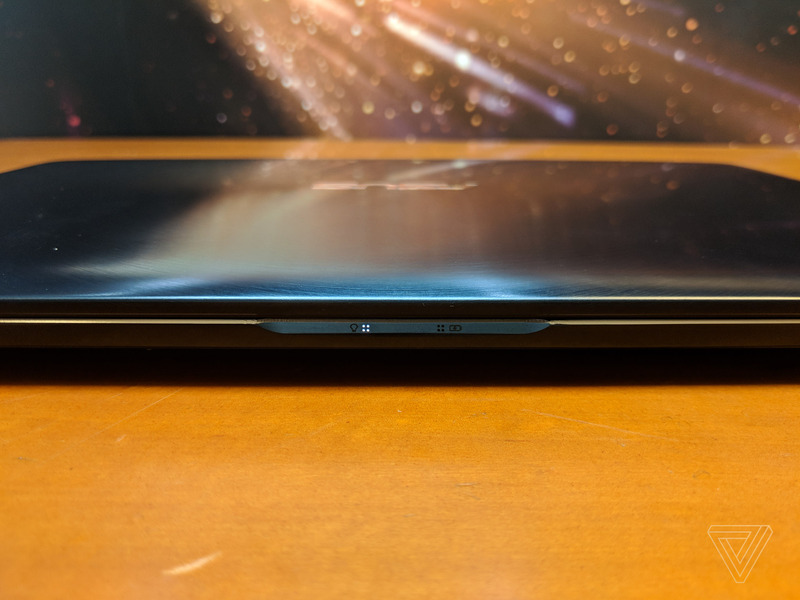 It can also play back YouTube videos via a Chrome extension, or it can simply extend the ZenBook Pro’s main display. I tried using it in all those various ways, and it wasn’t terrible. I quickly adapted to the switching between modes — which is done by pressing F6, no need for hunting around settings and menus — and where something wasn’t obvious, it only took a little trial and error to figure it out. 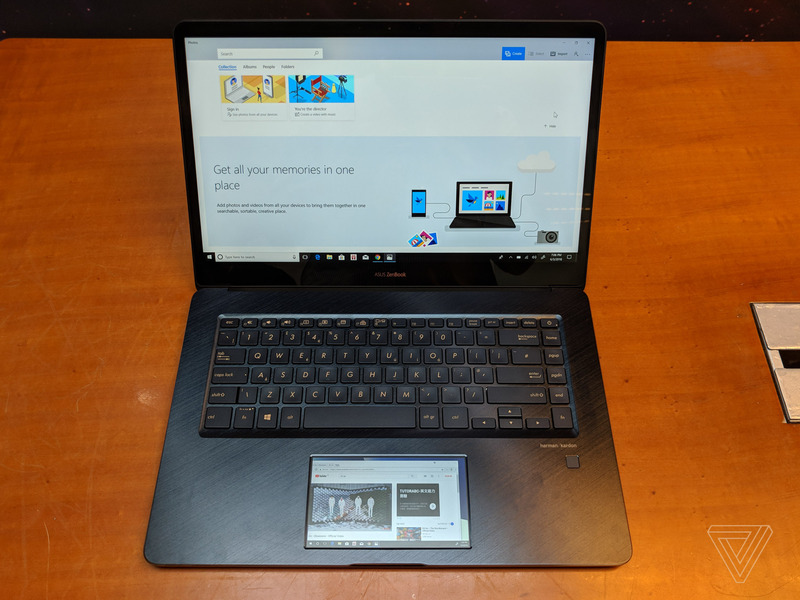 Perhaps the biggest confusion stems from the extender mode: that’s when I can drag a browser window directly off the main display and onto the ScreenPad. 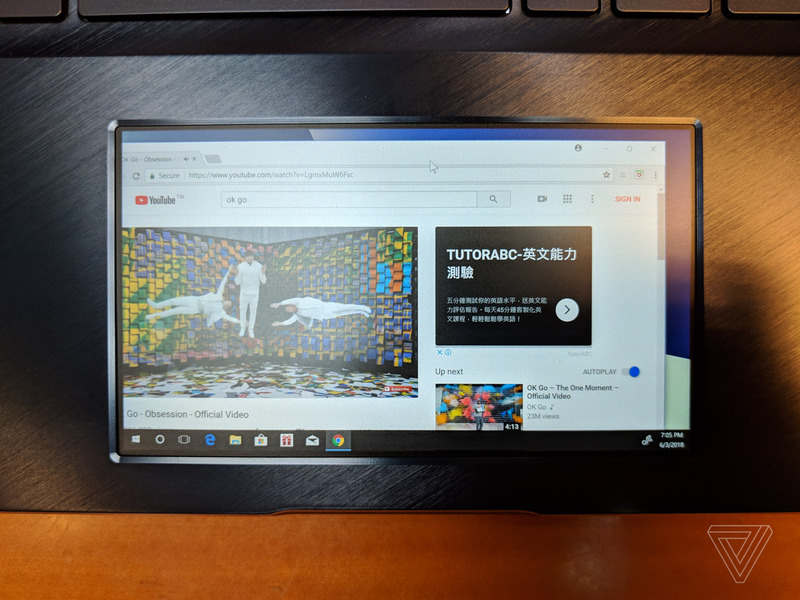 In that circumstance, I expect the ScreenPad to still be a touchscreen, but it just works as a touchpad, meaning I have to manipulate what’s on it with the cursor. 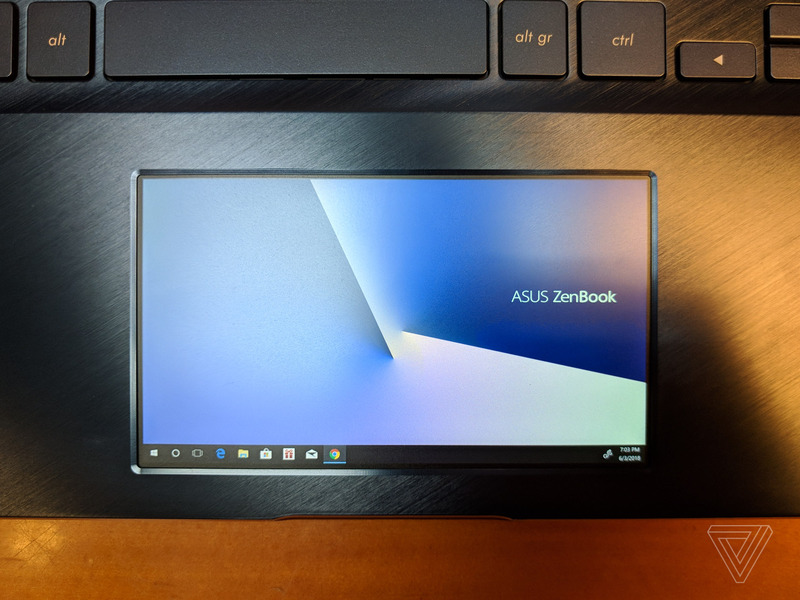 I know my praise sounds faint, but given the difficulty of inventing a whole new paradigm of interaction like this, I think Asus has made a promising start with its ScreenPad. Physically, this pad has a nice matte finish that feels good to the touch and reduces glare. 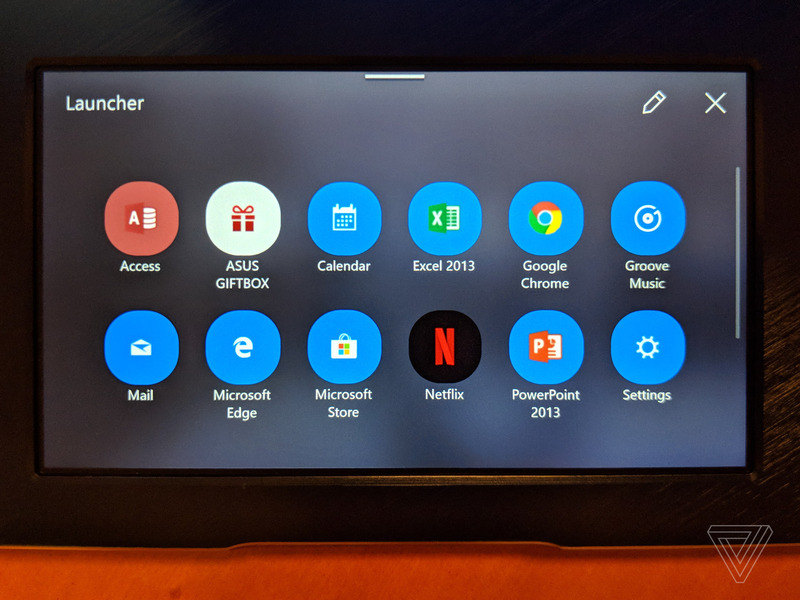 Asus has worked with Microsoft to develop Office integrations for the ScreenPad, so you get access to Word, Excel, and PowerPoint shortcuts and adjustments on it. 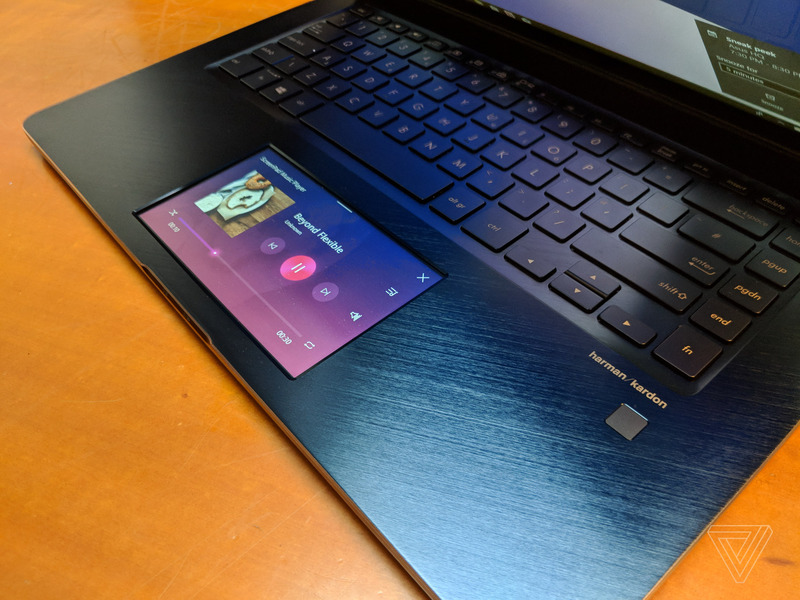 The pad can also function as a neat music and video playback controller, and Asus says it will support Spotify controls with it. 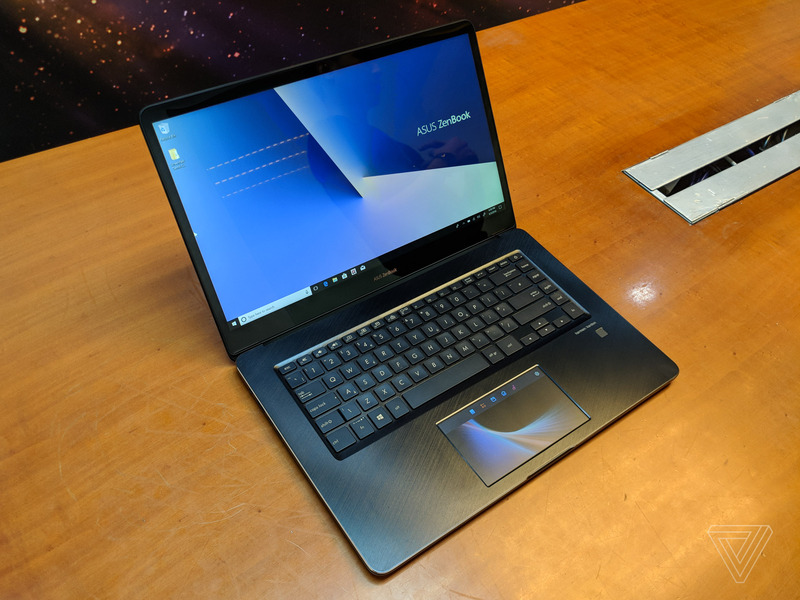 The ZenBook Pro’s maker is going to release a ScreenPad developer kit and is maintaining a website where all the compatible apps are listed, the majority of which will be found on the Windows Store. 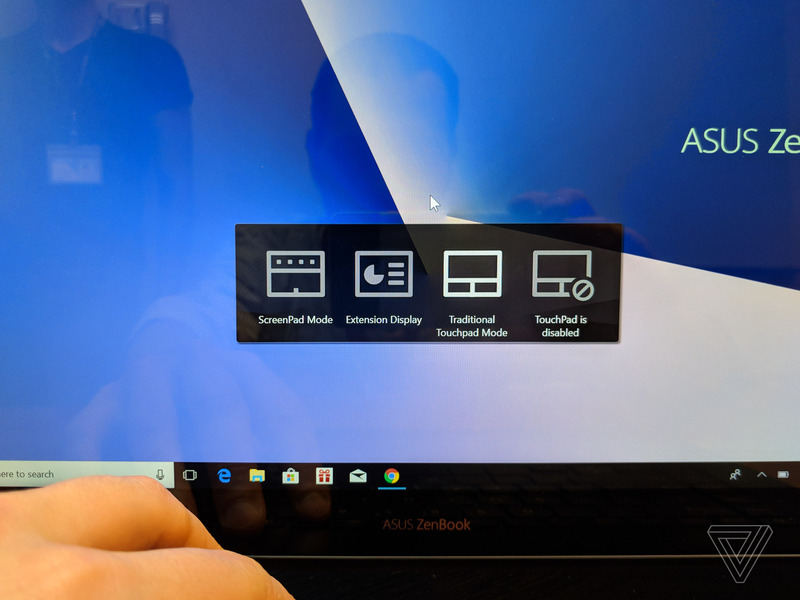 Knowing Asus’ poor track record with developing software and the Windows Store’s dire lack of popularity, I’m not brimming with confidence that this initiative will flourish, but I give Asus credit for trying. 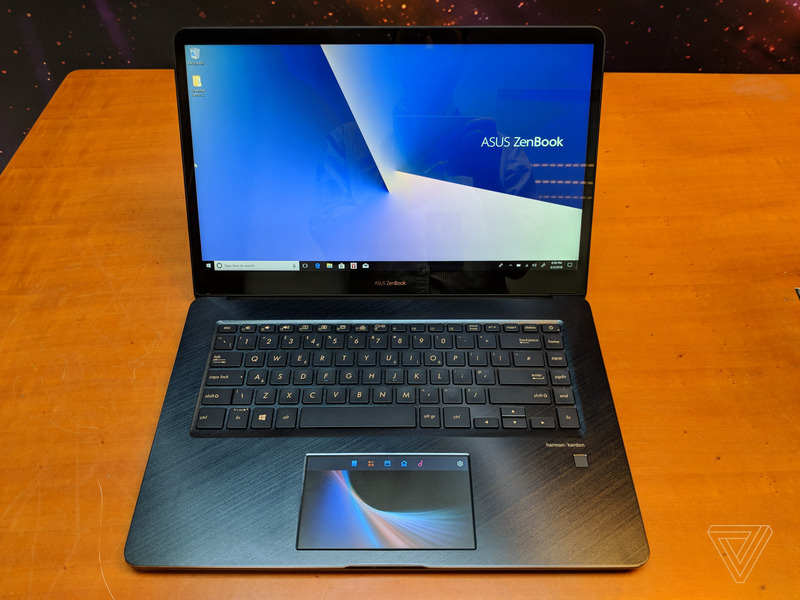 Beside having a touchpad it deems to be the next step in adaptive computing, Asus has plenty of other good things to boast about with the ZenBook Pro. 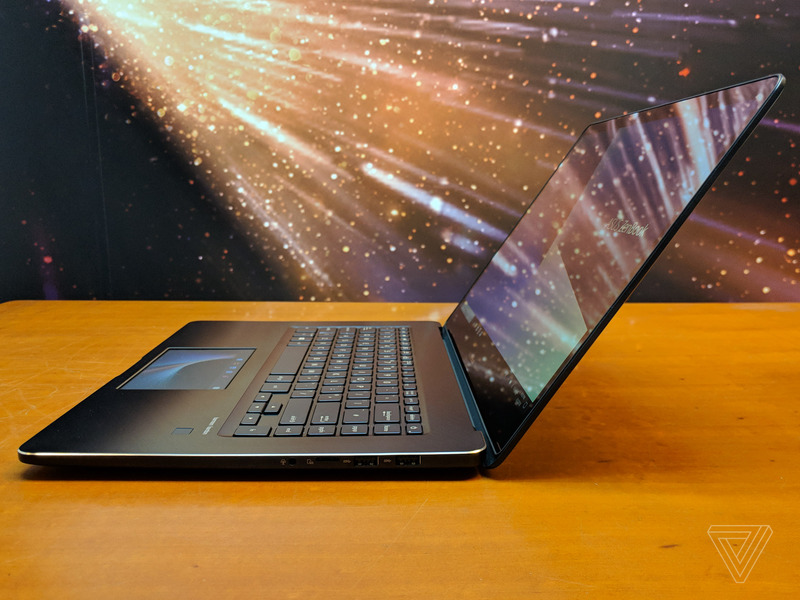 The 15.6-inch model of this laptop offers a 4K touchscreen with great color fidelity and bezels thin enough to make it the size of a more conventional 14-inch laptop. 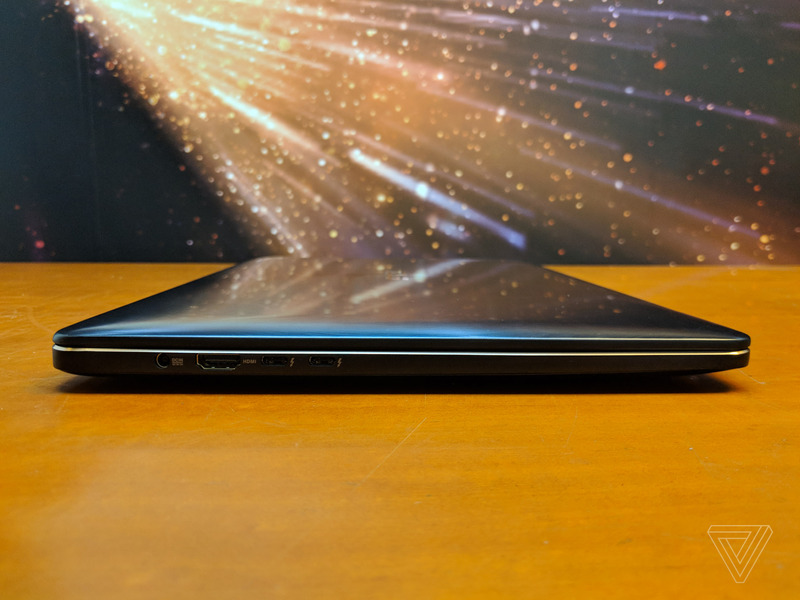 The 14-inch version, in turn, has roughly the same footprint as my 13-inch MacBook Pro. 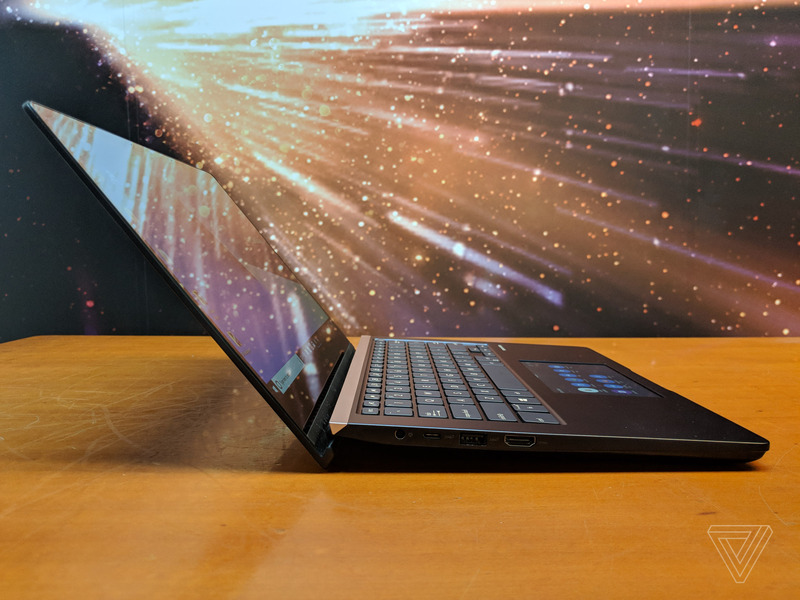 These are well built laptops, too, with aluminum on the top, bottom, and wrist rest of each. 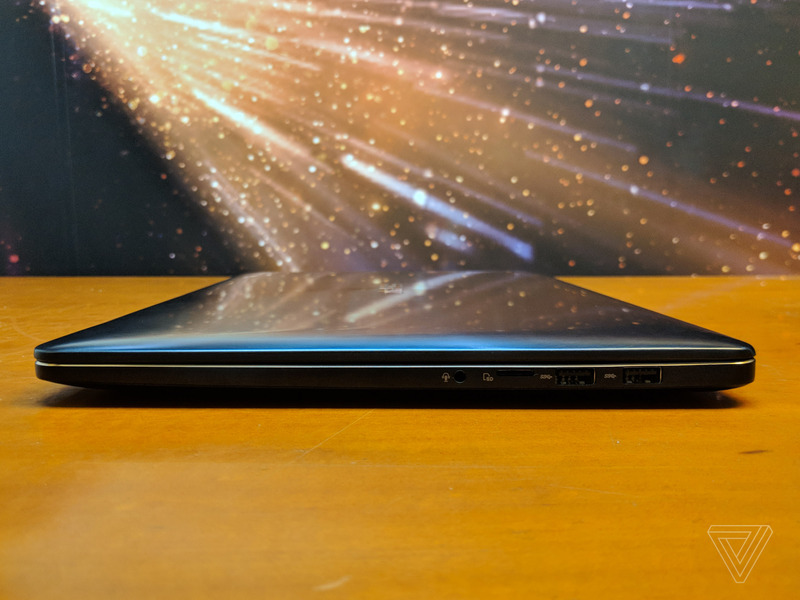 I could live without Asus’ signature concentric circle design, which the company calls “classic,” but I find evocative of some of the less successful models in its mobile PC range. 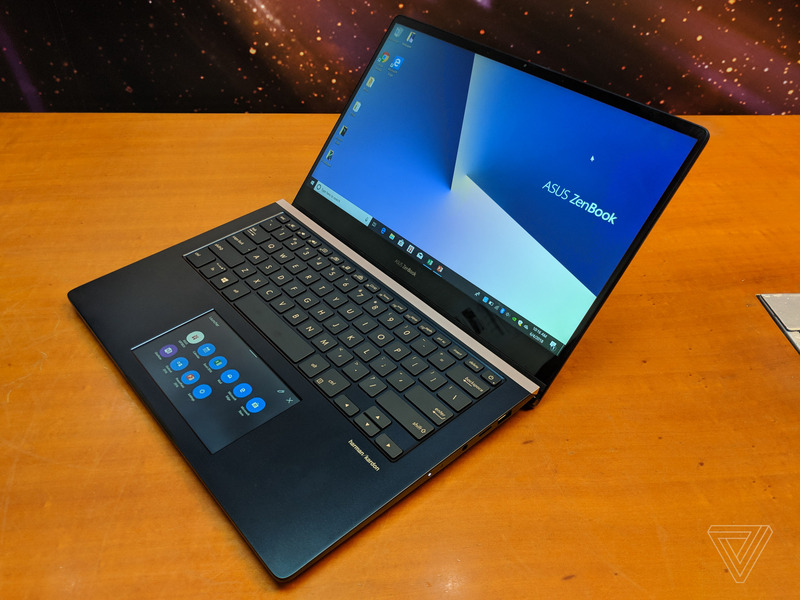 While testing the ScreenPad as a music controller, I was wowed by the quality of the speakers on the larger ZenBook Pro. 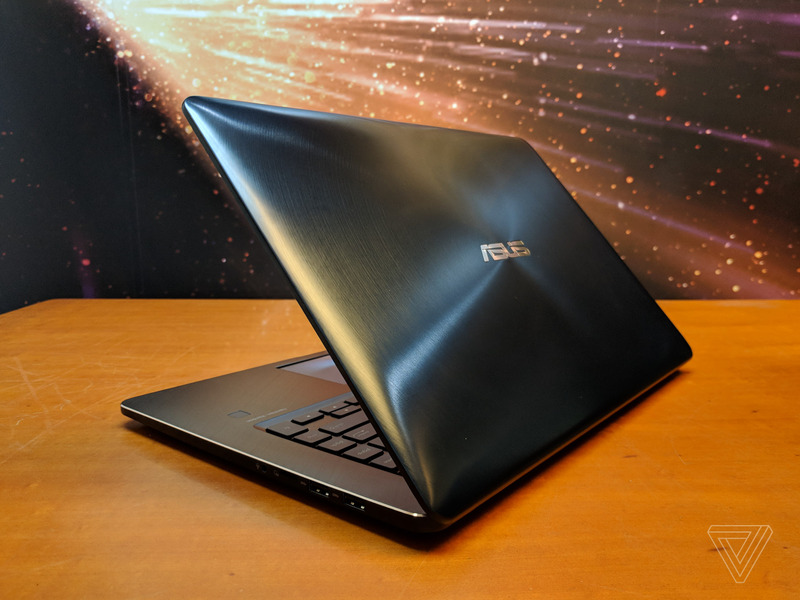 Asus has built an audio system that produces loud, rich sound with none of the tinniness and feebleness of typical laptop speakers. 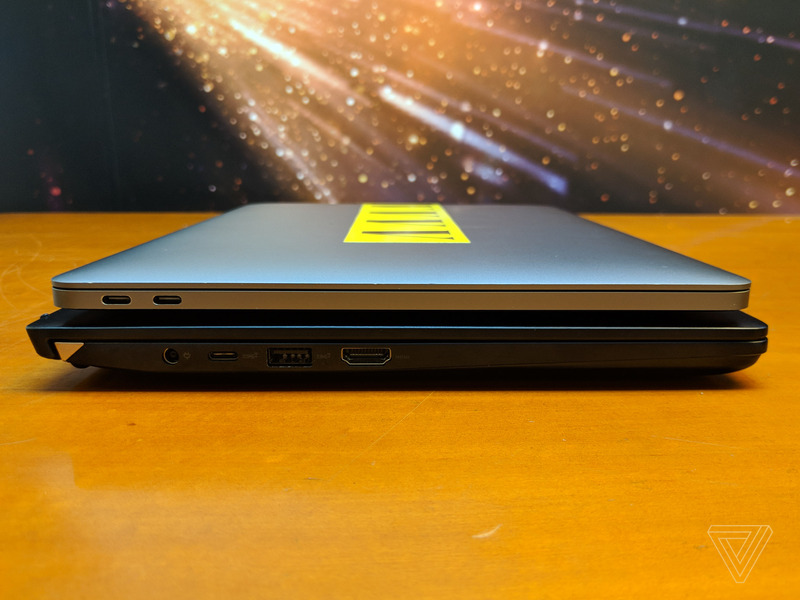 The 2016 MacBook Pro that I use has very good speakers, but the ZenBook Pro is markedly better. The improvement is so obvious that I can be sure of it even after only a brief listen. 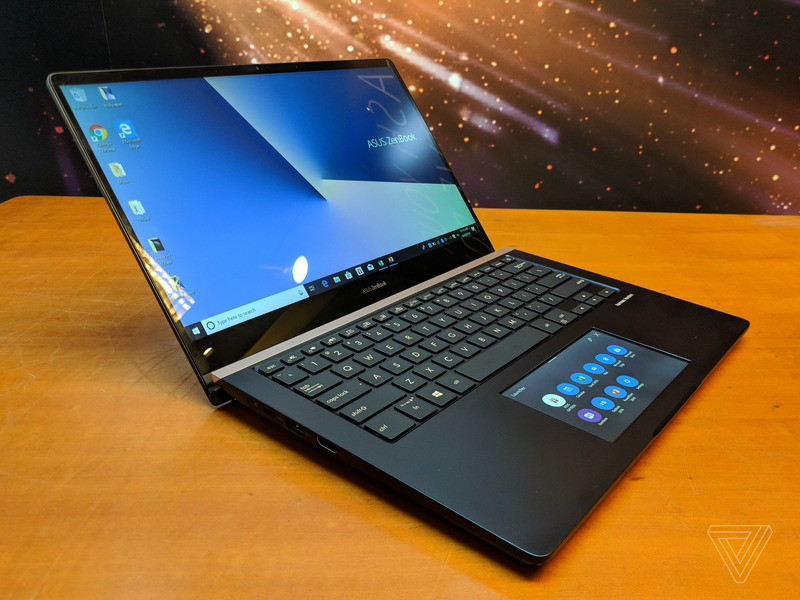 Asus says that it designed the ZenBook Pro with creators in mind. That’s the big demographic that PC makers are chasing at this year’s Computex: photographers, video makers, designers, basically anyone who can find use for a few extra CPU cycles. 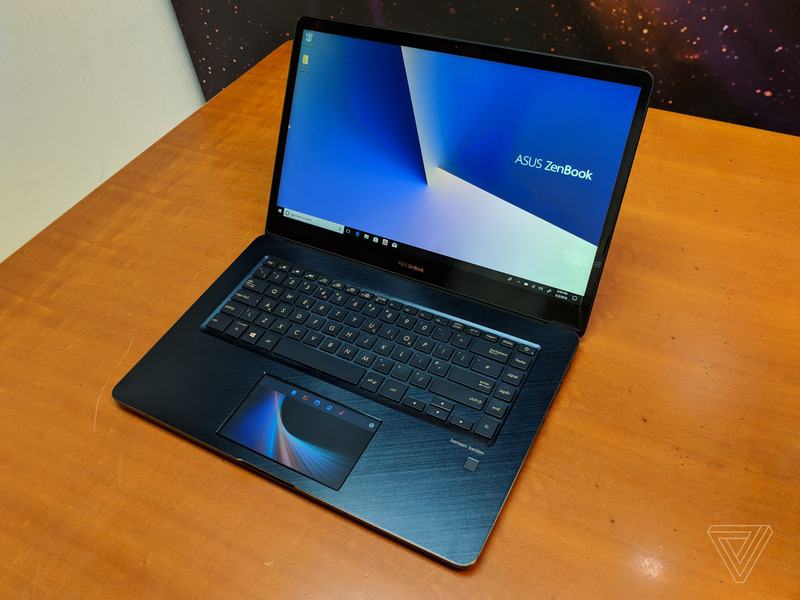 The common thread to all classes of digital creators is that they work with visuals, so Asus has tried to maximize the color accuracy of the ZenBook Pro’s screen, and it’s received certification from Pantone (though I couldn’t get an explanation of what that mark of approval signified). 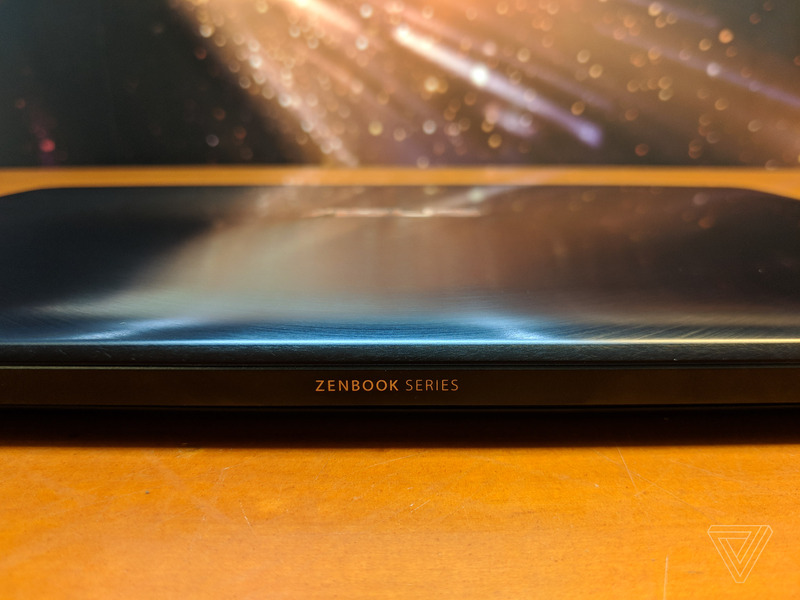 The ZenBook Pro offers 132 percent coverage of the sRGB color space and 100 percent of Adobe RGB. 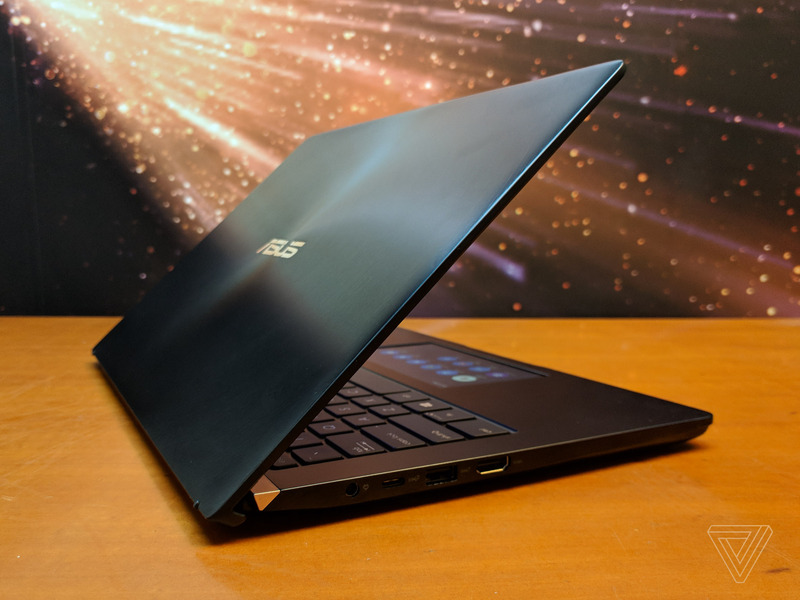 The smaller 14-inch ZenBook Pro has one of Asus’ ErgoLift hinges, the purpose of which is solely to elevate the keyboard for a more natural typing posture. 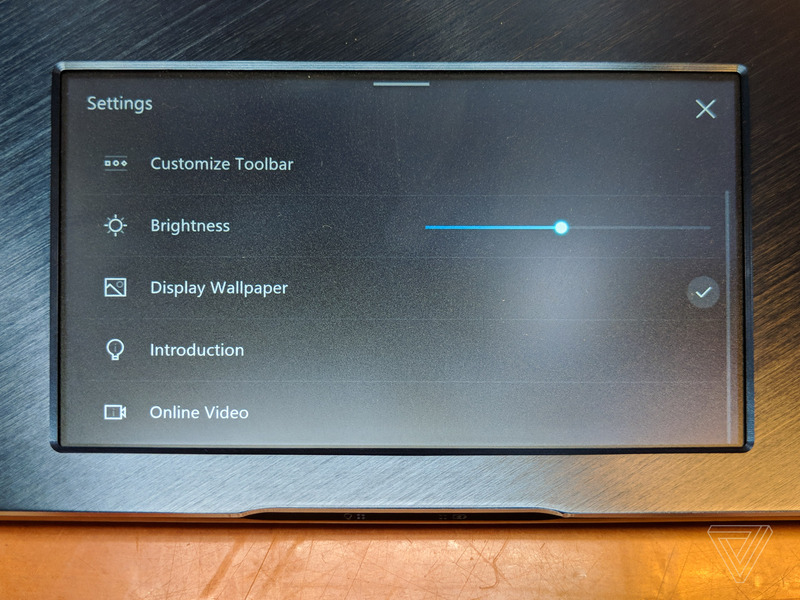 I can’t say how much of a benefit that is in long-term use, though I don’t see Asus sacrificing any other design element for it, so I’m fine with its inclusion. 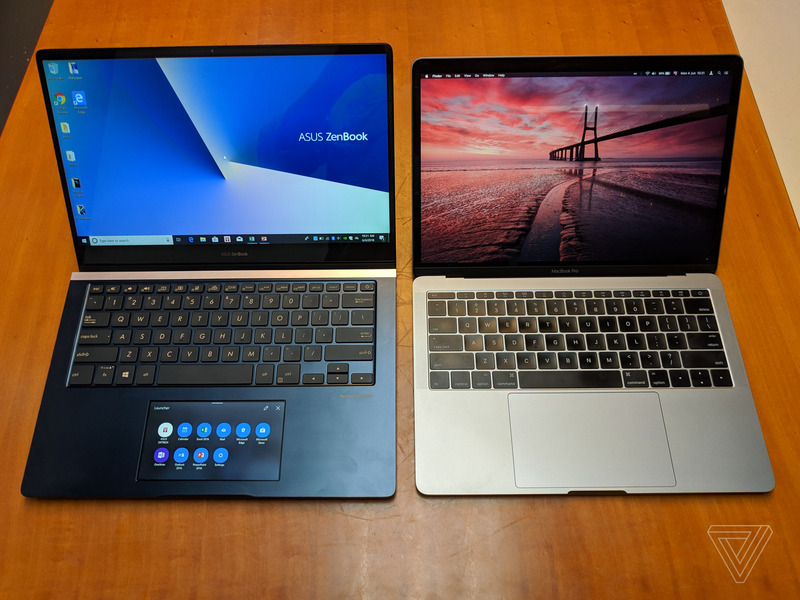 Given my preference for smaller laptops, I did find the 14-inch ZenBook Pro the much more appealing of the two. 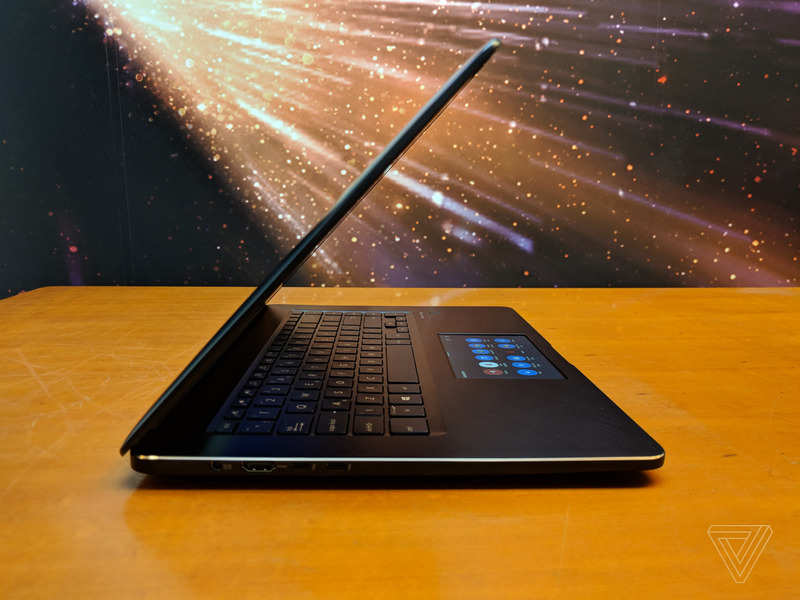 In terms of specs, it has a lower ceiling than its larger sibling, maxing out with a Core i7 CPU, a GeForce GTX 1050 Max-Q, USB-C ports without Thunderbolt 3, and an IR camera for Windows Hello instead of the fingerprint sensor of the Pro 15. 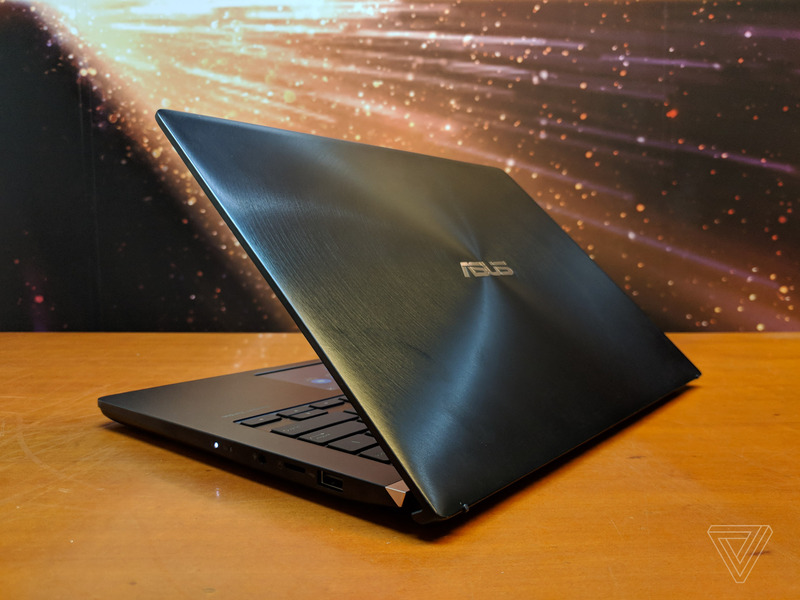 Asus is putting the ZenBook Pro 15 on sale in mid-July for a starting price of $2,299. 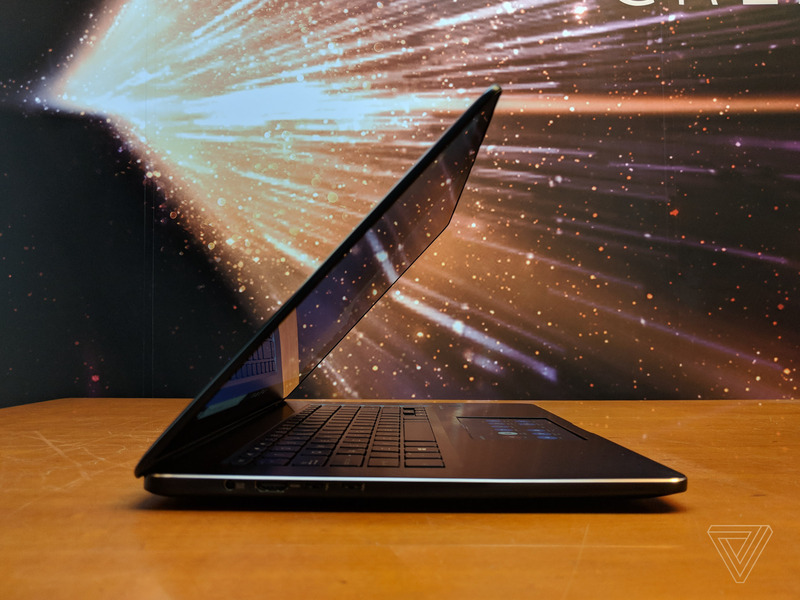 Its 14-inch counterpart will follow in the fourth quarter of the year, offering superior battery life of up to 13 hours. Both will come in Asus’ favored shade of so-called Deep Dive Blue. This article and images were originally posted on [The Verge] June 5, 2018 at 12:30AM. Credit to Author and The Verge | ESIST.T>G>S Recommended Articles Of The Day.